This page will be reposted around the middle of each month, as soon as SOI and UAH data for the previous month are available. However, let’s continue. 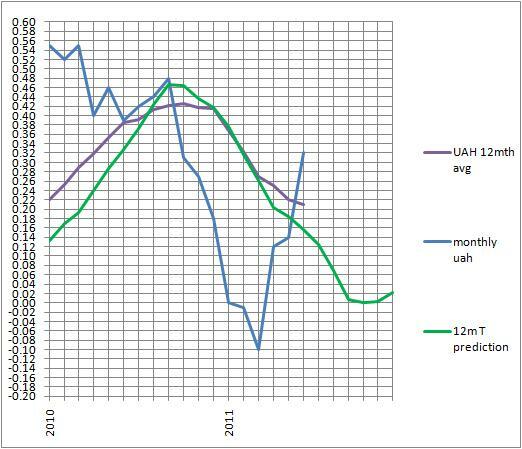 My December prediction for the 12 month running mean- and therefore the mean anomaly for 2011- is +0.02 +/- 0.1. I’m expecting another downturn, from my reading of the plot of Global Oceanic Reflected Sunlight by Dr Roy Spencer last week. Whether that will lead to 12 month means bottoming out as I have predicted remains to be seen. And that is entirely the point of these posts- to test a possible methodology for linking SOI values to global temperatures. You are currently browsing the kenskingdom blog archives for July, 2011.